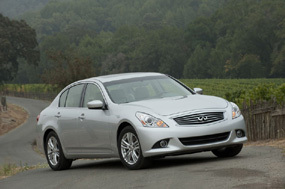 The entry-level Infiniti G25 powered by a 2.5-liter V6 joined the Infiniti G lineup for the 2011 model year in the US. The Infiniti G25 comes in a sedan bodystyle only and is available with all-wheel-drive. The new 2011 Infiniti G25 Sedan features the same dynamic exterior, interior and chassis as the G37, but with a smaller displacement engine. The 2.5-liter DOHC 24-valve V6 produces 218 horsepower and comes mated to a 7-speed automatic transmission. Both rear-wheel drive and an intelligent all-wheel drive (ATTESA-ETS) shared with the Nissan GTR are available. All models come with 17-inch aluminum-alloy wheels, ABS and electronic stability control (VDC) with traction control.